‘SWISS ARMY MAN’: POP…POPCORN POP…POPCORN! This is the lyric video for “Montage”—a single taken from the “Swiss Army Man-Original Motion Picture Soundtrack”. The song was written and performed by Andy Hull and Robert McDowell of Manchester Orchestra and features vocals by the film’s stars Paul Dano and Daniel Radcliffe. “Montage” will be released as a single on June 3rd. Lakeshore Records will release the album digitally on June 24th. A24 will release the film in LA and NY June 24th and nationwide on July 1st. 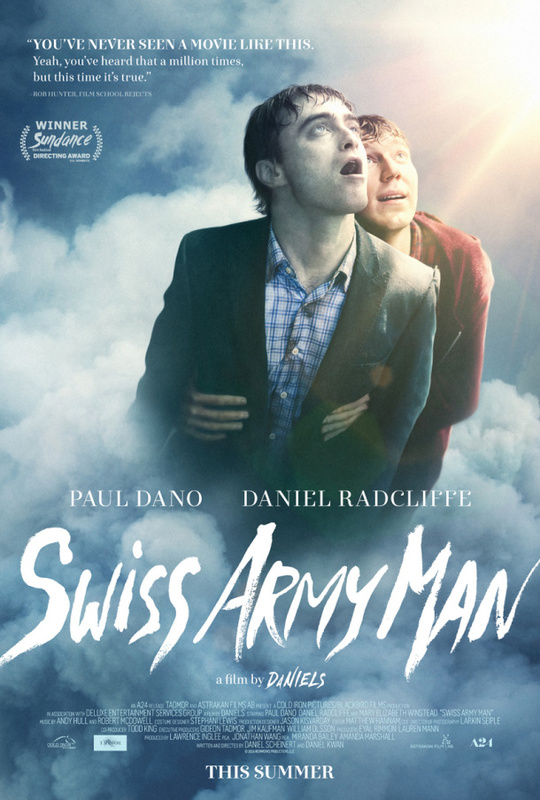 Outrageously fun and deeply affecting, “Swiss Army Man” is a gonzo buddy comedy that is the feature film debut of acclaimed music video directors Daniel Scheinert and Daniel Kwan (collectively known as DANIELS, and responsible for the visionary “Turn Down For What” video, along with Manchester Orchestra’s “Simple Math” video among many others). I’m so very looking forward to this movie, and the ridiculousness that will ensue. It is movies like this that make me sad Roger Ebert (because I have to link this like you don’t know who he is) is no longer with us. I would have loved to read his thoughts on a movie that half the audience walked out of in disgust. I can’t wait for July 1. I’ll drive to Kansas City, Oklahoma City, or even Dallas if I have to to see this. I’m trying to talk the manager of the Starlite Drive In to have it one or two nights, but, given the family movie nature of the Drive In, it suspect getting this movie in will be a hard sell.